I am a firm believer in my slow cooker. It’s my other half – cooking and preparing when I need to be in two places at one time. I use it weekly, if not daily! My goal is to find the best and easiest way to make my favorite foods. And most of the time, the easiest method is my slow cooker. Before I begin, a little about the cooker I use. Secondly, my ceramic insert recently cracked and I called Crock Pot customer service to replace it. Without hesitation they sent me a new insert free of charge. I was very surprised and pleased. 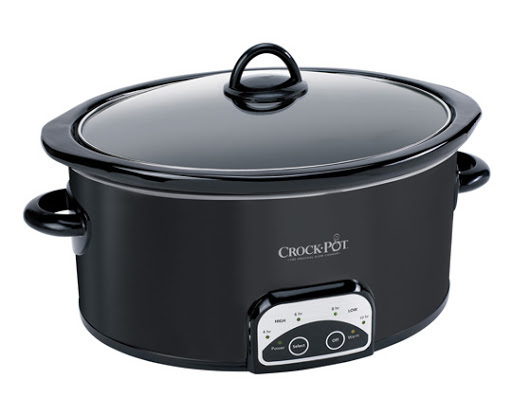 I am firm believer in buying quality brands, and Crock Pot has proved to be just that. I have not been asked to say anything on behalf of the company, I just like giving praise where praise is due. Now, onto my favorite uses for my cooker. If anyone asks me for dinner ideas, it is the first thing I always share. Seriously, it is has changed my life. 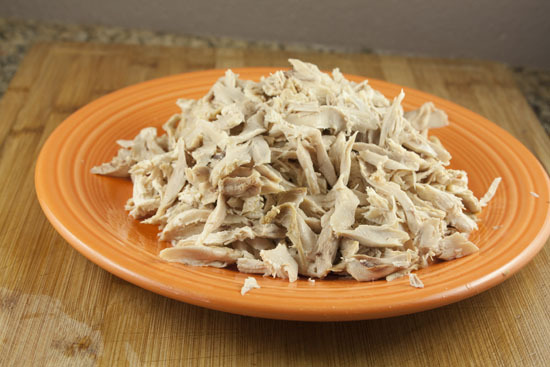 Use your slow cooker to make batches of shredded chicken. This is the simplest way to make chicken and it goes far. Salads: chicken salad, chef salad, pasta salad – any salad with chicken on top! Here is a list I use for ideas. I never run out of ideas. It is wonderful. My second use for my slow cooker is to soak and cook dried beans. 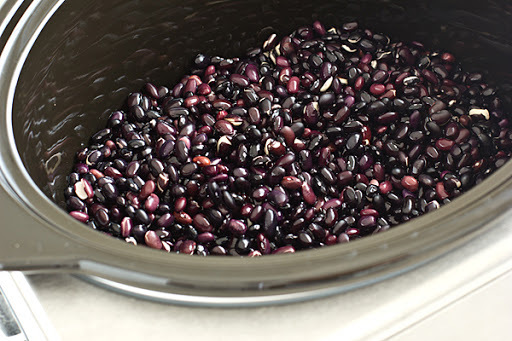 I love using dried beans because they are cheap and healthier than canned beans. But, I really hate the soak, simmer, and wait method, so thanks to my friend Amy’s recommendation, I have a new favorite solution. I rinse and sort my bags of beans and pour them into the slow cooker. I cover them with water and cook them all day. I have found it is better to cook these on low for a longer period of time. When they are done, they fill the cooker and are ready to be stored, eaten, or frozen. I usually spoon them into freezer bags (1-2 cups of beans/bag) and freeze when they are cooled. This makes about 4-8 full freezer bags per pound of beans and I use them in casseroles, soups, and main dishes. This is a great beginning to a large pot of chili in the slow cooker – just keep the beans in the cooker and add your chili ingredients for another round of slow cooking! This is my favorite slow cooker recipe, and again it is the invention of my friend Amy. Thanks, Amy! This is my favorite meal to serve company, and everyone raves over it. It is easy and delicious. Here is the wonderful Aztec Chicken. 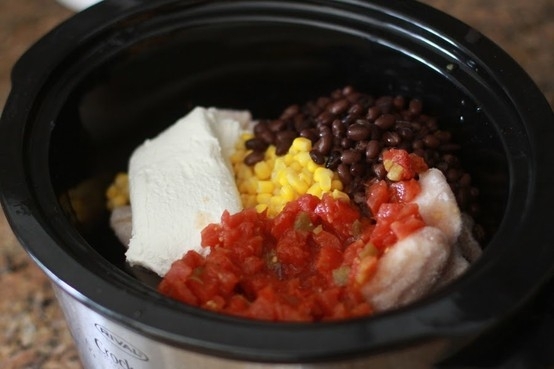 Combine beans, corn, garlic, cumin, and 1/2 of the salsa in slow cooker. Add chicken and pour the remaining salsa on top. Cook on high 4-6 hours, or low 8-10 hours. After cooking, shred chicken and add the cream cheese. Stir until melted. Serve over rice with cheddar cheese. 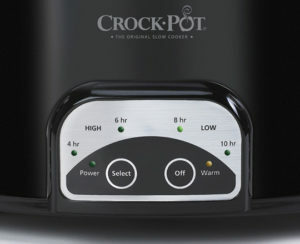 Please let me know if you have any favorite uses for the slow cooker – and I know I will have more ideas to share in the future. Bon Appetit!